The idents that launched the channel. Going all white with celebrities. More celebrities with a splash of colour. The first idents for the brand "five". Off to the fairground, car boot sale and a car wash.
'Five' disappears in these emotional idents. A circle and capitals sigansl a new logo for Five. The programming is the star. 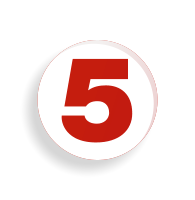 The return of 'Channel 5'.